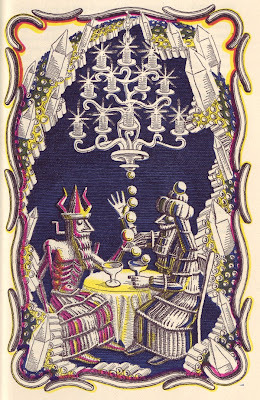 Illustrations by A. Alexeieff for Russian Fairy Tales, 1945. 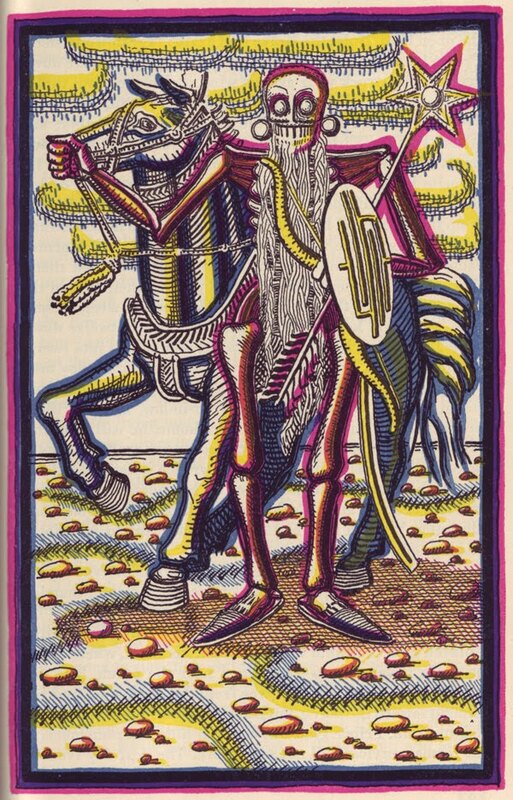 More of his images can be seen here. 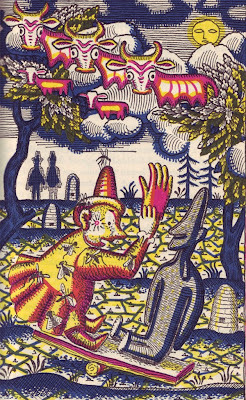 Here you can read a Russian version of Hansel and Gretel. Many critics think that the classic good dead mother/evil stepmother represents two projections of the same mother. This tale not only has that element, but two versions of the grandmother-the good, helpful grandmother, and the evil witch Baba Yaga. Also in this story, the children are saved by their kindness to animals who help them to complete impossible tasks and escape. On the Surlalune Annotate Twelve Dancing Princesses page, you can read the Grimms' notes from the versions they heard and used to create their own version. 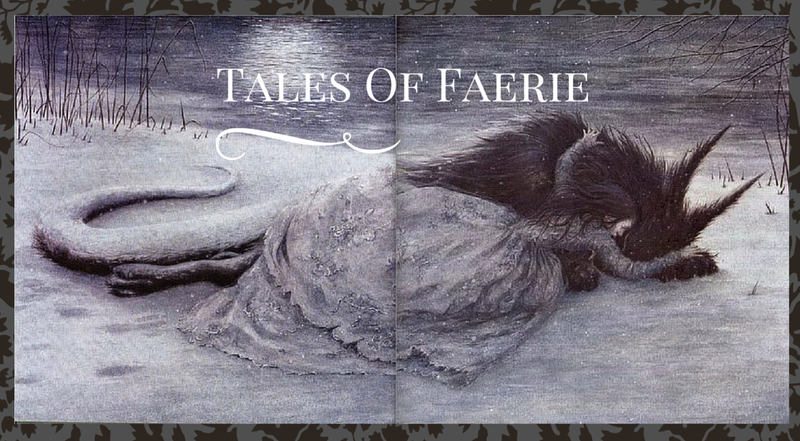 These tales are definitely different than the one we're familiar with-for example, either three sisters who wear out their shoes verses twelve, or one princess who wears out twelve pairs of shoes. 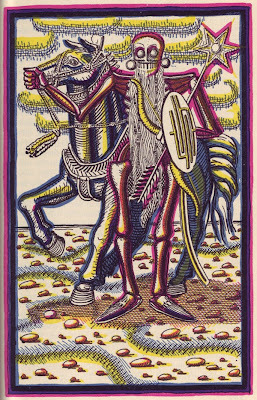 Clearly numbers are a significant thing in folklore, but even from the above example you can see numbers seem to be especially prominent in this story's versions, particularly 3 and 12-sometimes you'll see 11 or 13, but these numbers are really meant to be one more or one less than the complete 12. Click through to read the older versions and see more instances of 3s and 12s. "Three days and nights: The number and/or pattern of three often appears in fairy tales to provide rhythm and suspense. The pattern adds drama and suspense while making the story easy to remember and follow. The third event often signals a change and/or ending for the listener/reader. A third time also disallows coincidence such as two repetitive events would suggest. The reasons and theories behind three's popularity are numerous and diverse. The number has been considered powerful across history in different cultures and religions, but not all of them. Christians have the Trinity, the Chinese have the Great Triad (man, heaven, earth), and the Buddhists have the Triple Jewel (Buddha, Dharma, Sanga). The Greeks had the Three Fates. Pythagoras considered three to be the perfect number because it represented everything: the beginning, middle, and end. Some cultures have different powerful numbers, often favoring seven, four and twelve. " I think I'd have to rank Twelve Dancing Princesses as my second favorite fairy tale, the first being Beauty and the Beast. The secret kingdom and the dancing are definitely elements I love, but I think a more subtle factor may be the ambiguity. Normally, good and evil are very black and white in fairy tales, which I don't necessarily dislike, it's an element of the genre. But the nature of the curse is unclear-if no one were beheaded because of it, would it even be a curse? To quote from Heidi Anne Heiner again: "The callousness displayed by the princesses is often troubling to many critics and readers. Are the princesses really that cruel or are they under an enchantment? 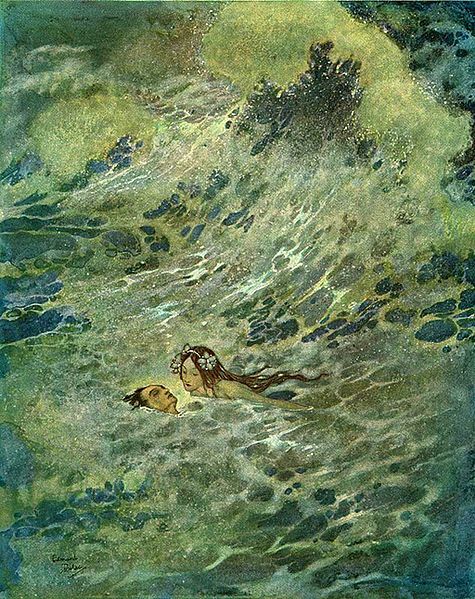 The answer is left for your own interpretation"
"The composer referred to The Enchanted Lake (1908) as a "fable-tableau," and it was his favorite among his compositions: "How picturesque it is," he wrote to a friend, "how clear, the multitude of stars hovering over the mysteries of the deep. 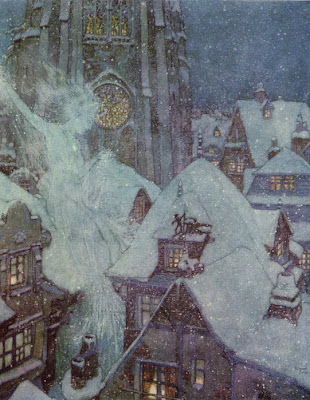 But above all no entreaties and no complaints [which he associates with the sounds of trumpets and trombones, which are banished]; only nature -- cold, malevolent, and fantastic as a fairy tale. One has to feel the change of the colors, the chiaroscuro, the incessantly changeable stillness and seeming immobility." The piece is indeed a marvel of mystical serenity, the waters gently stirring under starry skies, in suggestively shifting major and minor thirds and ninth chords supported by deep pedal points, with the "enchanted" sounds of harp and celesta, and delicate flute traceries (all in the Rimsky manner)." 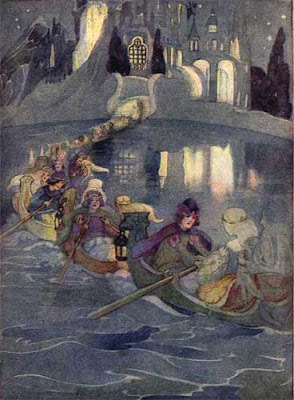 In my library there are several books on the brothers Grimm but none exclusively on the history of the Arabian Nights. 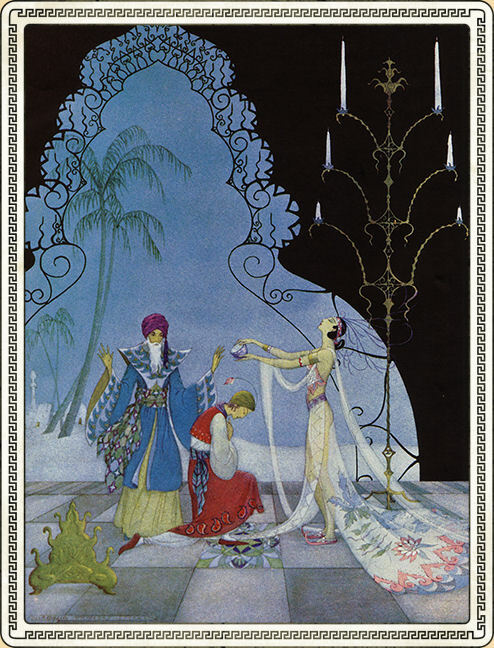 The following information is taken from the chapter "The Splendor of the Arabian Nights" from Jack Zipes' When Dreams Come True: Classic Fairy Tales and their Tradition. The Arabian Nights is more unique than just another culture's collection of folktales because of its framework story: that of Scheherezade heroically saving her own life and that of countless other women by telling stories to Shahryar, the king who was so incensed by the adultery of his first wife that he took to marrying and killing a different woman each night. This framework story was modeled after a Persian book called Hazar Afsaneh, or "A Thousand Tales", translated into Arabic in the ninth century. The individual tales themselves differ from collection to collection. 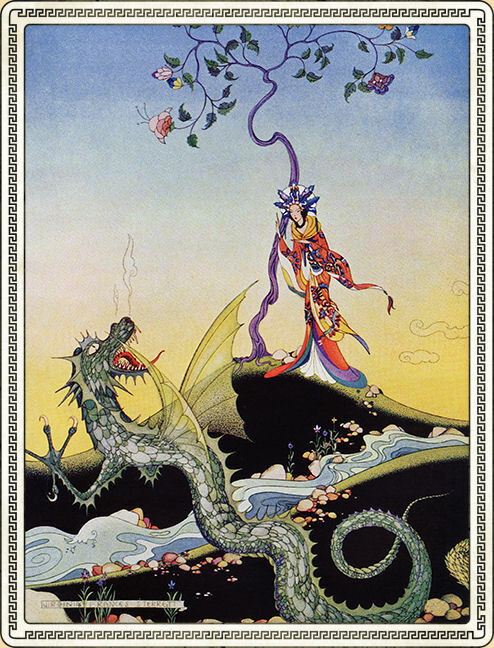 The tales as we know them today are mainly taken from Persian tenth century tales with some Indian elements, tenth century tales recorded in Baghdad, and Egyptian stories written down between the tenth and twelfth centuries. 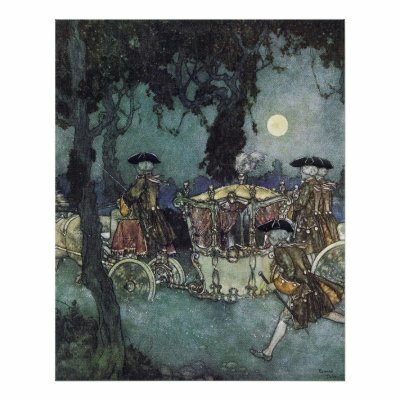 But, similar to other collections of fairy tales around the world, these were probably circulated orally for hundreds of years before being written down, and afterwards have become an important influence in Western stories. 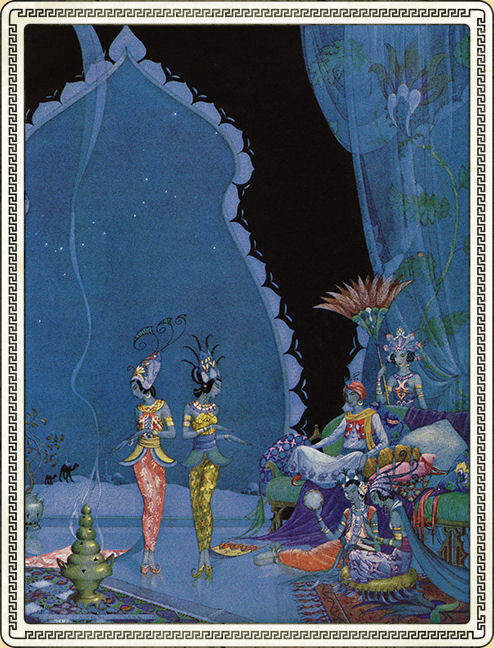 The Arabian Nights were translated into French by Antoine Galland between 1704 and 1717, whose literary talents made the tales popular and eventually were translated into multiple languages, with the most famous English translation by Richard Burton (who plagarized a lot from an earlier English translation by John Payne). Due to the Scheherezade story, the tales have clear purposes-firstly, for Scheherezade to educate and recivilize Shahryar and show him that he can regain his trust in women. Secondly, Scheherezade's sister Dunazade is also an audience member, so the tales are Scheherezade's passing down of advice to her younger sister and enabling her to navigate through society. The readers themselves are the third audience, who become educated alongside Shahryar and Dunazade into values of the time and culture-justice, the importance of creativity and wit, and most of all, empowering the oppressed. The power of story itself cannot be ignored either-through the ultimate happy ending that Scheherezade's determination brings about, as well as four other major tales that employ the same motif of people telling stories to save innocent lives. As an obvious lover of stories myself, that's the most intriguing part of the Arabian Nights to me. I found this passage fascinating, as it's something I had wondered about myself: "Given the patriarchal nature of Arabic culture, it would seem strange that Scheherezade assumed the key role in the Nights. Yet, a woman exercised more power in Moslem culture during the Middle Ages in Baghdad and Cairo than is commonly known," including ultimate power over children and slaves, including children's educations, marriage, profession, and sexual initiation. 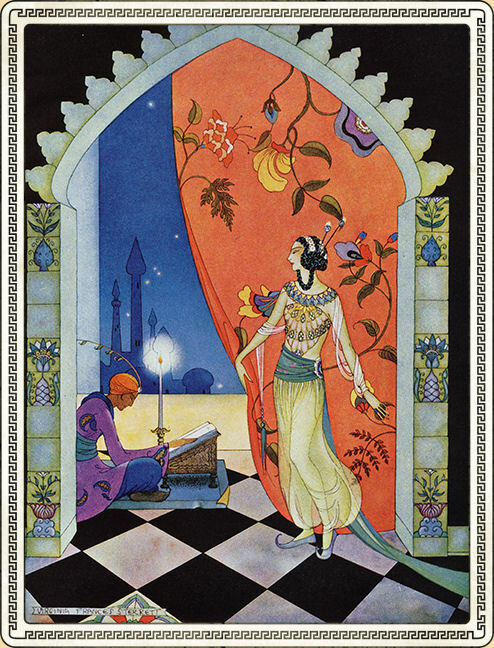 Interestingly, the title was originally One Thousand Nights, and no one knows how it became The Thousand and One Nights. Zipes speculates that it had something to do with the fact that odd numbers were considered lucky in Arabic culture. I personally find the perfectly even "one thousand" to be a little too practical, while "the thousand and one" adds a touch of whimsy and almost a hint of the eternal, as if no matter what the number, there's always one more to be heard the next night...(there are not literally one thousand tales in the collection. There are 42 "core" tales in Galland's translation, but apparantly the complete collection of Payne's collection included nine volumes). Definitely like Grimm better than Once Upon a Time. The trailer gives you a good feel for the first episode-but especially in light of my post on the cultural misuse/misunderstanding of the phrase "fairy tale," I find this line very ironic: "This isn't a fairy tale. The stories are all true." Umm...don't you therefore mean, "this is a fairy tale, but maybe you need to readjust your thinking about them"? But it just occured to me-the inspiration for the second episode was Goldilocks, which was NOT a Grimm fairy tale. (Read more on Goldilocks here). But, for anyone who's curious, the tale "The Queen Bee" is an animal helper tale-the kind where the hero shows compassion on various animals and later they help him accomplish a series of impossible tasks. In this case, an anthill helped him find one thousand pearls, some ducks retrieved a key from the bottom of a lake, and the queen bee of a hive he saved sniffed honey off the breath of the youngest princess, enabling him to marry her. Full text can be read here. I found a couple of faerie-related books at a library book sale I had never heard of before. The first was Photographing Fairies by Steve Szilagyi...which I also just found out has been made into a movie, which seems to have pretty good reviews. The novel's inside flap promises to take the reader back in time to the 1920s and see the story of the Cottingley Fairies through the eyes of a young photographer. Sir Aurthur Conan Doyle figures in as a character- he was a believer in the photographs himself, and I like historical fiction that blends as much fact as possible in. 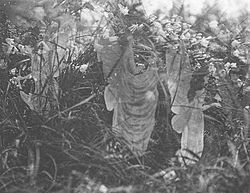 I assumed the novel would prove to us that the Cottingly Fairy hoax was actually true, and it was proved by this photographer, which seemed interesting enough, but the book actually skims over the Cottingley Fairies and concentrates on a competitive (fictional) set of photographs, which also happened to involve two girls in a garden. But I'm glad that the premise of the book was not to make the hoax true-although the pictures are pretty impressive considering that the fairies were drawn by a 16-year old and 10-year old girl, I agree with Szilagyi's assessment of them: "Your pictures are crude concoctions pandering to the popular idea of what a fairy is supposed to look like. Look, this fairy here is wearing a gown. Where did she get that? Are there fairy dress shops? Are there fairy mills where they weave the fabric? And who works in the mills and dress shops?...what I do know is that if there are fairies, they don't look like popular illustrations. They'll look how they look. Not how we want them to look." The novel was entertaining but I especially enjoyed Szilagyi's interesting ideas on what a separate race of people could be and the implications of discovering such a thing. 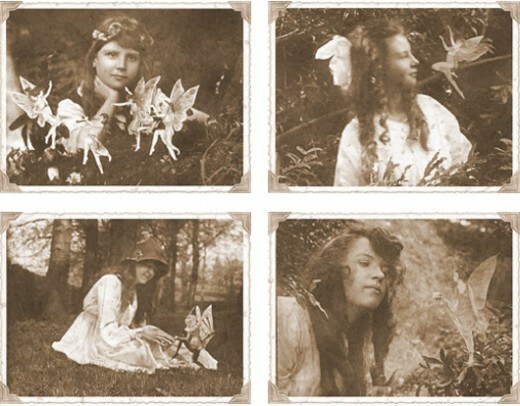 The fairies as we see them in the book are still diminuitive and we don't ever discover if they are a complex, powerful group of beings such as in true fairie lore or a simple-minded, cute garden adornment hardly any different than butterflies (or the Tinker Bell fairy of the popular imagination). At least Szilagyi leaves you to ponder the possibilities yourself. I also really enjoyed this passage, from when the main character, Castle, is still unsure as to if the fairies actually exist or not and another character gets stung by a bee: "Templeton's sting was a rebuke from nature. While we search the garden for tiny, imaginary versions of ourselves, we miss entirely the more fantastic creatures that crowd there, more mysterious and impenetrable than any parallel universe of floating fays." Interestingly, the year the movie for this book came out was the same year Fairy Tale: A True Story came out, a movie about the Cottingley Fairies, represented as a true story. My mom rented that movie for me once when I was sick and even being younger, I resented them misusing the phrase "True story", for I knew it wasn't true although I knew none of the details at that point. 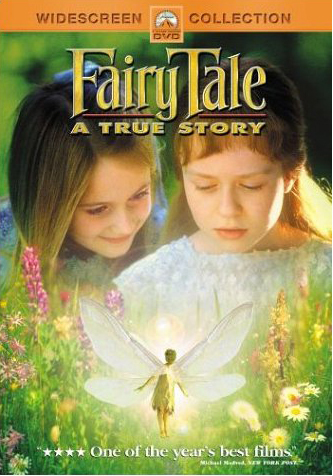 The story was "true" in that there really was an incident, but not in the sense that the fairies were real as the movie portrayed. However, for those who still want to believe, this is the final photograph that Frances insisted was genuine, even though Elsie claimed it was also a fake. This interesting quote came from Frances at the end of her life: "I never even thought of it as being a fraud – it was just Elsie and I having a bit of fun and I can't understand to this day why they were taken in – they wanted to be taken in." 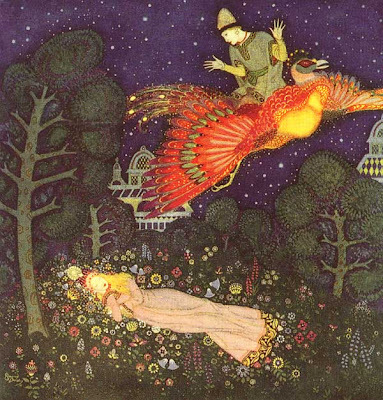 It's more difficult to find online information on fairy tale illustrators than authors. 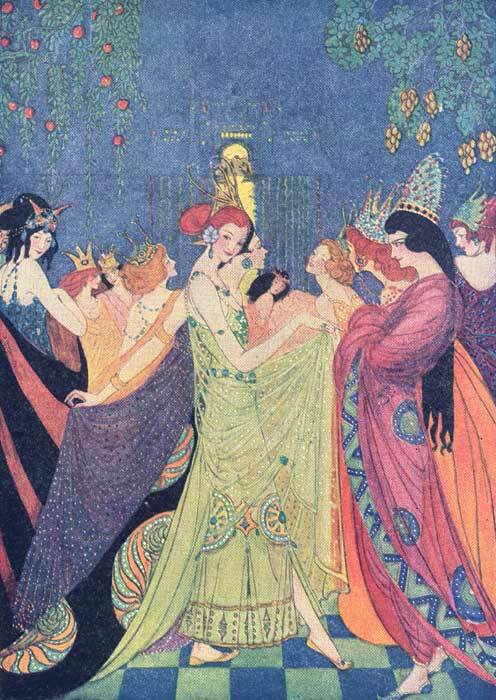 Edmund Dulac (1882-1953) is one of the most well known fairy tale illustrators, for good reason. Was he personally drawn to the source material, or did his style just happen to suit it well and he complied with commissions? 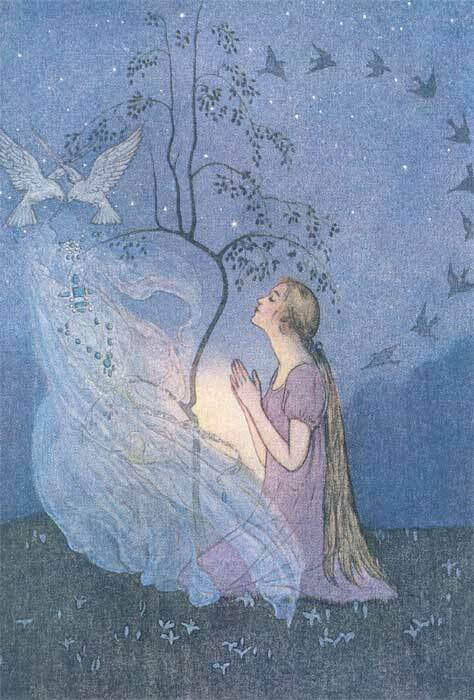 It's hard to believe from these gorgeous images that he wasn't at least a little inspired by the stories. He started his career illustrating some other favorite literature of mine, Jane Eyre and Edgar Allen Poe poems. Later in his life he even designed banknotes and stamps for France. There's only two episodes of Once Upon a Time up so far but I'm not too into it. The premise itself could be really interesting: regular people who are secretly fairy tale characters. I've been intrigued with this concept of fairy tales being somehow true-as accounts of past true tales, or prophecies of things to come, are themes I play around with in my own stories. I'm glad to see that in this age where fairy tales are usually either parodied or twisted, there is this increasingly popular approach to fairy tales that holds, it seems, a little more respect for the old stories. However, it disappointed me that the tv show's idea of a storybook character is to reference aspect of stories which are exclusively Disney-Jiminy Cricket, Maleficent, a guy in jail whistling "Whistle While You Work..." makes me wonder if they did any research beyond watching Disney classics. The script is kind of cheesy. The good characters are sort of bland and the bad characters not that evil-the only character I find interesting is Rumplestiltskin. This supposedly dark, evil curse that even the other witch is afraid of is...to make Snow White become a teacher in a cute American town. That's...my life and I think it's pretty great. All that talk about taking away everyone's happiness and all they hold dear-what is that, exactly? The most shallow idea of "happily ever after" that implies that nothing ever goes wrong again? That's all they really lost. Okay, and their memory of their past life. But still, not a very evil plot-making them live normal lives-compared to the history of villainous deeds the classic tales feature. The beginning seemed a little too much like Enchanted for me-I couldn't take it seriously. The whole sending them to a place where "there are no happily ever afters" which turns out to be our world, and then the constant obvious offering of poisoned apples to the protagonist...and I love Enchanted, but that's a parody for kids, and this was, I thought, supposed to be a more serious exploration of fairy tale characters for adults. Update-I wrote the above before finishing the second episode. I like the element where the Wicked Queen has to kill the heart of the thing she loves the most-an interesting twist on her ordering the heart of Snow White and adds depth and backstory to her character. I do plan on watching more episodes, and maybe my opinion will shift. Reader Radha Pandey is doing a project on trees in folklore, myths, and legend, and we've started a discussion in the comments to my post on Juniper Tree, but I wanted to make you all aware of it so we could have more input. So far we've thought of, obviously, the Juniper Tree, as well as Cinderella variants where the tree is a way for Cinderella to communicate with her dead mother and receive gifts from her. Also, I'm very glad that reader Dawn alerted me to the Grimm tale One-Eye, Two-Eyes, and Three-Eyes because of my interest in beauty standards and society's treatment of people who don't measure up to them. In this tale, which is similar to Cinderella, the stepsisters have one and three eyes, respectively, and mistreat their sister who has two eyes "like regular people." Though it's unusual that Two-eyes is mistreated because she is normal, those who are different are still represented as evil, for ugliness and evil go hand in hand in so many tales. (Two-Eyes, of course, just happens to have great beauty.) 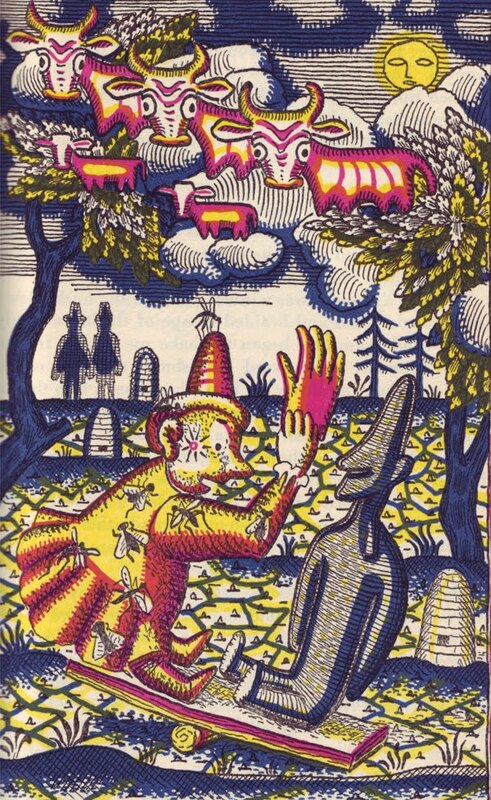 But the tree is very significant in this tale as well, for after Two-Eyes' animal helper, a goat, has been killed by her mother, from the entrails springs a magical tree with golden apples. The tree is also the means by which Two-Eyes is made known to a knight that passes by, for the tree will only allow her to pluck fruit from its branches. In both of these tales the tree is a means of preserving someone's spirit after they've died, and a way of giving help and gifts to the living. In the Firebird, there is another tree with golden apples, which the Firebird steals. 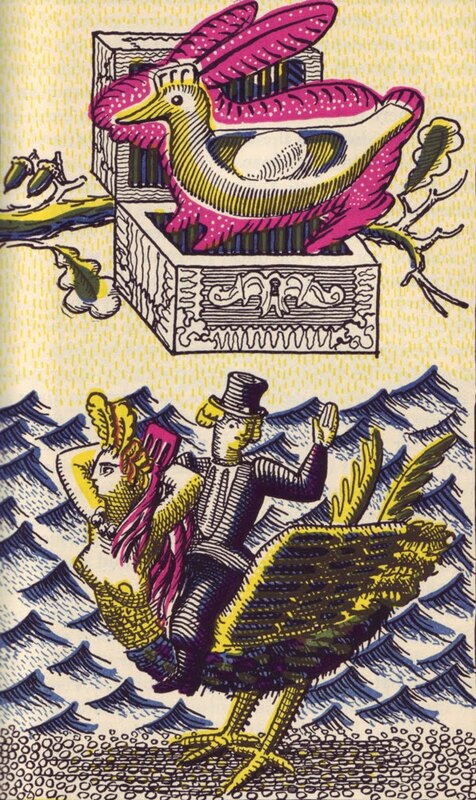 Ivan's catching of the Firebird in the garden kickstarts his adventures. What else is out there? I may know a little about folklore but virtually nothing about myth and legend.